Cancun is a wonderful beach vacation option for young parents looking for sand, beautiful turquoise waters and relaxation. The weather is near perfect in the winter, and resorts are amenity rich and a quick drive from the airport. Despite it's many redeeming qualities, Cancun does have its quirks, and can occasionally be frustrating to navigate for an American or Canadian that is used to orderly lines, clear rules, and fair, transparent exchange of cash for goods and services. 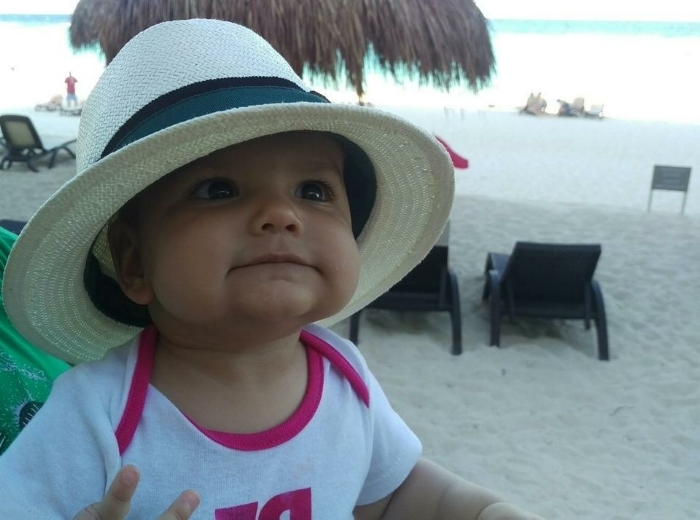 The Littlest Passport spoke with our parent reviewers for their tips on navigating Cancun, so that you can maximize beach time and minimize stress. Don't assume that staying at a "kid friendly" Cancun resort means facing a week of breakfasts with Spongebob Squarepants and lounge chair views of cartoon character-themed wading pools. Read our reviews of Cancun area resorts. All have been visited and endorsed by young families, and offer plenty of "ahhhh" moments for the adults while being suitable - and fun - for your little ones. Mexico provides an online version of its Immigration form, meaning that you can fill it out on your computer and print it off before leaving home. No more digging through your purse and diaper bag looking for a pen with a squirmy lap child! According to their website, some airlines will stop handing out immigration forms on their flights - even more incentive to print the forms before you fly. You can print out the forms here. DO NOT THROW AWAY YOUR IMMIGRATION FORM AFTER PASSING THROUGH AIRPORT CUSTOMS! You must hold on to your immigration forms and present them again upon departure. If, like many tourists, you throw out these documents, you will be required to pay a fee of $32 USD pp. It's a total tourist tax and a not-so-fun way to end your vacation. So hold on to those documents! If the Customs Hall is busy upon arrival, make a beeline for the computer kiosks stationed at the far side of the hall. The machines scan your passports, allowing you to slip into a much shorter line to have your documentation reviewed by a border agent. You'll then collect your luggage and get into another line, where you will need to present your completed Customs documents to an officer, and may be subject to a random bag search. Avoid the official looking Mexico tourism booths by the airport exit. My husband approaching an employee to inquire about ground transportation between two hotels, and after 20 minutes, realized that the "deal" he was being offered required us to sit through a 90 minute time share presentation. The employee repeatedly misrepresented the truth throughout his pitch. The whole thing felt slimy and was a waste of our time. Most resorts have a concierge that can set your family up with transportation or activities - use the concierge instead. Plan ground transportation from the airport to your hotel before your trip. Unlike most North American airports, there is no orderly taxi line, and Uber does not operate in Cancun. Taxis from the airport will cost approximately $45 USD to Cancun's Hotel Zone, which is quite steep, given most hotels in the Zone are a 15-20 minute ride from the airport. You can save some money by booking a round trip taxi service at the airport. My husband, being somewhat frugal, has twice been tempted to start "shopping around" for better taxi prices at the airport. They don't exist. We've only gotten frustrated and wasted time. So, do yourself a favor - accept that you will be overcharged for your ground transportation, and pre-arrange in advance. Rates can be cheaper this way, and you can also book luxury transportation complete with snacks and beverages. You can start by reaching out to your hotel for their recommendations. Most resorts offer Kids' Club areas where children 4 years and older can be dropped off for a fee. Most also allow younger guests to visit the space with an adult - though be sure to confirm this with any resort you are considering. Beyond Kids' Clubs, there are plenty of babysitting options for parents looking for some adult time. You may be able to book services directly through your resort. Otherwise, there are many reputable babysitting services - a quick Google Search will reveal options in your resort area. The agency we hired did not require upfront payment, which was ideal - we didn't feel "locked in" to using the agency or the nanny for the entire week if baby and nanny didn't jive. Beyond an hourly rate, our agency charged $15/day for taxis out of the Hotel Zone. Though you won't need cash (except for tips) on the resorts, if you plan to make purchases off resort, bring along both US dollars and pesos. Many ATMs on resort premises charge a hefty "exchange fee" to take out cash - the ATM at our resort charged 15% to take out USD. If you need to take out cash while in Cancun, you'll do much better to use an exchange bureau (many hotels have these, operating within daytime business hours) or at an actual bank. Our nanny agency did not take credit card and insisted on US dollars. Meanwhile, a taxi we took between hotels took US dollars, pesos and credit card, but charged a 15% service fee on credit cards, and also charged a similar premium for paying cash in US dollars. Avoid getting into the situation of finding yourself low on funds and needing to take out cash pronto by coming prepared with a mix of pesos and US dollars.